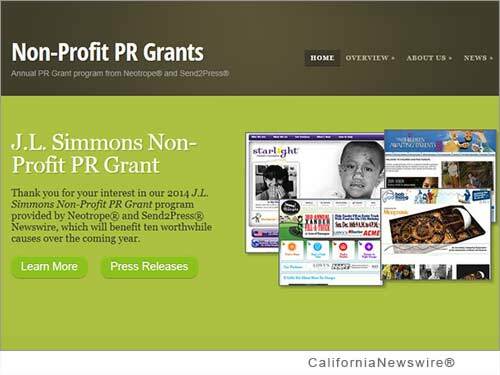 TORRANCE, Calif. /California Newswire/ — Neotrope, a 31 year old brand marketing, PR, and content development firm in California, today announced launch of its latest annual PR Grant program for U.S.-based 501(c)3 charities for 2014. Launched in 2000, the non-profit PR Grant was designed to help raise awareness of selected charities to traditional media, to the public, as well as to potential "halo" sponsors and donors. As part of this in-kind grant program, Neotrope is providing PR solutions, news dissemination (through its Send2Press(R) Newswire service), and social media marketing for the charities. Average value of each grant is $2,500 to a minimum of 10 non-profit organizations "doing good" on a local or national level, with a total minimum value of $25,000. Qualified applicants also receive a 30 percent discount on most services. There is no fee to apply, and applications are being accepted now through August 31, 2014 at http://prgrants.com/. Starting this year the application period has moved from winter to summer. "We've been donating time and expertise whenever possible, since day one in 1983," said Christopher Simmons, member PRSA and ASCAP, and Neotrope CEO. "When we launched the formal PR Grant program in 2000 our intention was to leverage our background in public relations and marketing; we felt it more useful to help an organization 'spread the word' over giving orgs a small cash donation. Almost 15 years later, we're very proud to have successfully helped many worthy causes raise awareness, needed funds and get ink with this PR Grant program." Since 1983 Neotrope(R) has delivered services to raise organization awareness including brand identity, marketing, public relations (PR), and social media services. Neotrope is also an entertainment publishing company involved in books, music, software, and online magazines. The company has been at the forefront of many communication and technology movements for over three decades. Neotrope was an Inc. 5000 company in 2009, has an A+ rating with the BBB, and is a member of GS1. Information: http://www.Neotrope.com/. The Non-Profit PR Grant(TM) program was originally launched in 2000 to help assist U.S. 501(c)3 worthy causes to raise awareness, attract halo sponsors, and better connect with donors and volunteers. Other PR industry firms have since copied the name, but ours is the original. Starting in 2013, the Grant was named after the company co-founder, the late Dr. J.L. Simmons, PhD, who passed away in 2003. Now the Neotrope PR Grant program is known as the "J.L. Simmons Non-Profit PR Grant." With this cause-related marketing grant program, Neotrope has been honored to help many worthy causes in past years, including Camp Blue Skies, Catalysts Powering Educational Performance (CPEP), Center for Student Opportunity, Children Awaiting Parents, Fresh Start Surgical Gifts, Girls Write Now, Move for Hunger, The Native Voices Foundation, Special Equestrians, Starlight Children's Foundation, World Savvy and dozens more. Additional information regarding the Neotrope 2014 J.L. Simmons Non-Profit PR Grant program for U.S. charitable non-profits and grant recipients can be found at: https://www.send2press.com/non-profit/ or http://prgrants.com/ or on Facebook at https://facebook.com/NonProfitPRGrants .